As a result of the changeover to the new WLTP test procedure, the Volkswagen Group delivered fewer vehicles in October than in the prior-year month. All in all, 846,300 vehicles were handed over to customers globally, a fall of 10%. In the month under review, the fall in deliveries in Europe – at 15.6% compared with the previous year– was significantly less pronounced than in September. Double-digit growth was recorded in South America, contributing to an increase of 2.6% to 8.98 million vehicles delivered from January to October in a stagnating overall market. 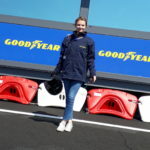 In Europe it was evident that the Volkswagen Group was working hard on the changeover of its models to the new WLTP test cycle. Following the severe fall in deliveries in September, the situation in October improved significantly, with 295,400 vehicles delivered (-15.6%). Especially Western Europe continued to report weaker figures as a result of the WLTP changeover. In October, 229,300 vehicles were handed over to customers, 19.3% fewer than in October 2017. In Germany, the negative impact was especially pronounced, with a fall of 23.2%. In contrast, a turnaround was reached in the region of central and eastern Europe in October and deliveries, at 66,100 vehicles, again reached the level of October 2017. Once again, Russia was a strong driver, with 21,300 vehicles handed over to customers – 22.4% more than the previous year. The positive performance in this region also contributed to the 2.3% growth in deliveries in January to October, compared with the previous year, to a total of 3.7 million vehicles. 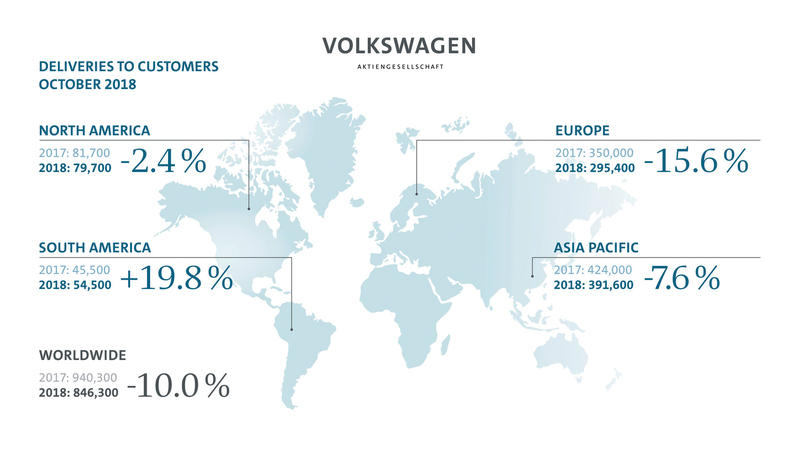 In North America the Volkswagen Group delivered 79,700 vehicles to customers in October, representing a fall of 2.4% compared with the previous year. Here, Canada recorded growth of 4.8%, compensating for the lower figures in the USA (-3.6%) and Mexico (-3.1%). In January to October, deliveries in North America reached a total of 793,000 vehicles, slightly below the prior-year level (-0.9%). In South America the group recorded a significant rise in October compared with the previous year: 54,500 vehicles were handed over to customers, an increase of 19.8%. In the month under review, Brazil remained a growth driver, with 41,800 vehicles handed over to customers, a rise of 56.7%. This more than compensated for the continuing weakness of the Argentinian market, where deliveries, at 7,000 vehicles, fell by 48.7% in difficult market conditions. Deliveries in the Asia Pacific region in October declined by 7.6% to 391,600 vehicles. The tense economic situation in China, the largest market in the region, as a result of the tariff dispute with the USA, continues to have a negative impact on performance in the region. The reluctance of Chinese customers to purchase vehicles continues. In China, 365,100 vehicles were handed over to customers, a fall of 8.3% compared with the previous year. Since the beginning of the year, the Volkswagen Group has handed over 3.4 million vehicles to customers in China, an increase of 3.4% compared with the prior-year period.